The internet continues to be a boon for creators, their communities, and the content industry. At Google, we are committed to helping these industries flourish online. Today, Google’s services provide content for people all around the world and generate significant revenue for rightsholders. YouTube alone has now generated over $2 billion to rightsholders by monetizing user-uploaded content through Content ID, its industry-leading rights management system. We take protecting creativity online seriously, and we’re doing more to help battle copyright-infringing activity than ever before. Today, we are releasing an update to our "How Google Fights Piracy" report, which explains the robust programs, policies, and technologies we have put in place to combat piracy online. Leading the industry in finding copyright solutions that work: We go above and beyond the requirements of the law to lead the industry in finding solutions that work. Content ID is a great example of this. Content ID goes beyond a simple "notice-and-takedown" system to provide a set of automated tools that empowers rightsholders to automatically claim their content and choose whether to track, block or monetize it on YouTube. 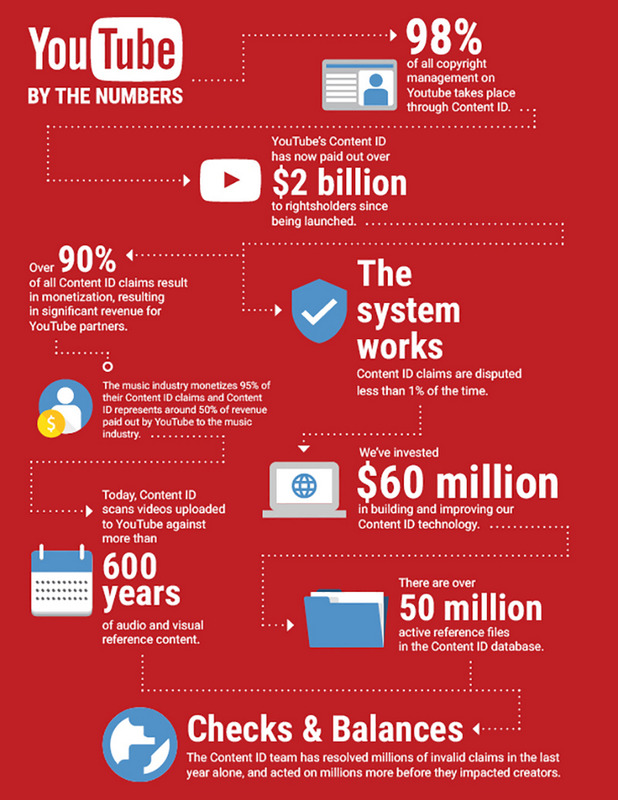 Content ID is a highly effective solution, and today over 98% of copyright management on YouTube takes place through Content ID, with only 2% being handled through copyright removal notices. Connecting fans to better legitimate alternatives: The best way to battle piracy is with better, more convenient, legitimate alternatives. And Google is all-in when it comes to partnering with the content industry to build and enable those alternatives. Through YouTube and Google Play, Google is in the business of helping users legitimately discover, purchase, and enjoy music, movies, books, magazines, and apps. Thanks to these platforms, Google Play has paid out more than $7 billion to developers, while YouTube has paid out more than $3 billion to the music industry. Today, Google Play also makes music available in 62 countries, movies in 105 countries, and books in 75 countries. Solving for Search: Thanks to the efforts of Google’s engineers, the vast majority of media-related queries that users submit every day return results that include only links to legitimate sites. For any problematic links that may appear for rarer “long-tail” queries, our systems for processing copyright removal notices handle millions of URLs each day, in less than 6 hours on average. And when we get a large number of valid notices for a site, our search ranking algorithms demote that site in future search results. Following the money: Rogue sites that specialize in online piracy are commercial ventures, which means that one effective way to combat them is to cut off their money supply. As a global leader in online advertising, Google is committed to rooting out and ejecting rogue sites from our advertising services. Since 2012, Google has blacklisted more than 91,000 sites from AdSense for violating our policies against copyright infringement, the vast majority caught by AdSense’s own proactive screens. We have also been working with other advertising leaders to craft best practices aimed at raising standards across the entire online advertising industry, including in the U.S., U.K., France, Italy, and Asia. Protecting and fostering creativity online is a priority for Google. We remain committed to investing in efforts to address copyright infringement online, collaborating with rightsholders and protecting the interests of our users.